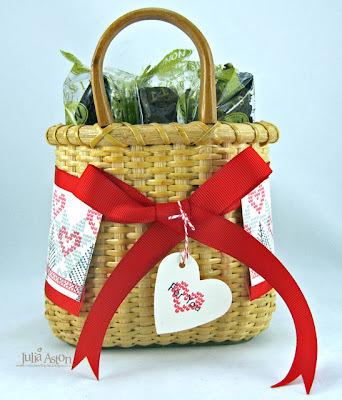 A Christmas bag, a basket of flowers and pots of tea! I was more inspired by the glassine bag than the colors or images. 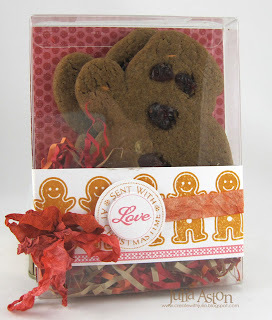 I created a Christmas gift bag that could be for a gift card or cash or even treats if they are not too thick! 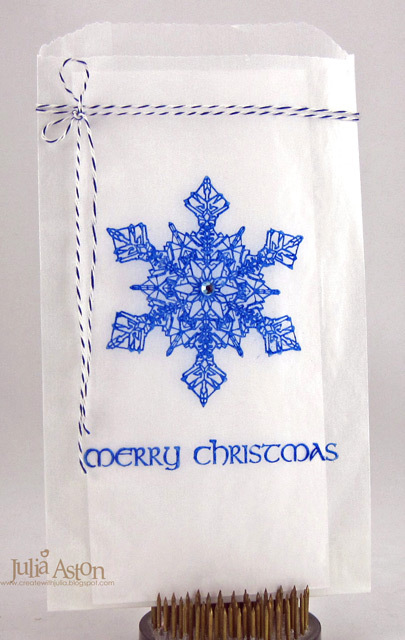 My stamps are from Rubbernecker I just love this beautiful snowflake and the font on this sentiment! I added a rhinestone to the center of the snowflake and tied blue/white twine around the top. My bag is 3 3/4" x 6 1/4". from Papertrey Ink. 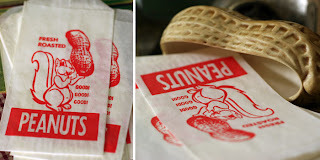 I used Versafine Ink to stamp the images and I used my hot gun to help the ink dry - I think I'll leave this over night to be sure that it does dry - you may have to sample different kinds of ink if you stamp on a coated bag to be sure it dries. The weave of this basket reminded me of the wood tone on the thermos. First I stamped the flowers on the panel, then drew on stems with a fine tip green pen. Then I dry embossed the panel with my Square Lattice embossing folder. I cut the sentiment with my key tag punch, then punched a hole on the side with my horizontal slot punch (I haven't used this punch in years!) 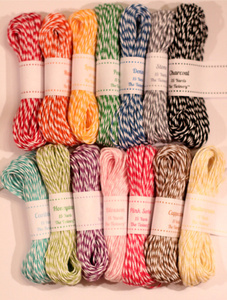 and looped 4 colors of twine through the slot. I adhered the tag to the card with foam tape. 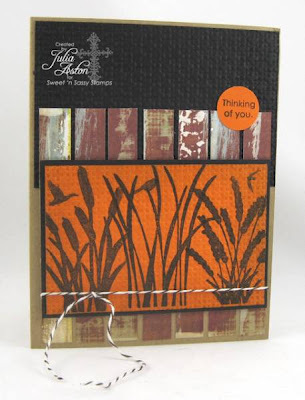 The Thinking of You sentiment is also from Rubbernecker. This card is 3 x 5 1/2" so it will still fit into a regular A2 envelope even with the tag and twine sticking off the edge of the card. Instead of drinks and appetizers - I used a row of teapots. 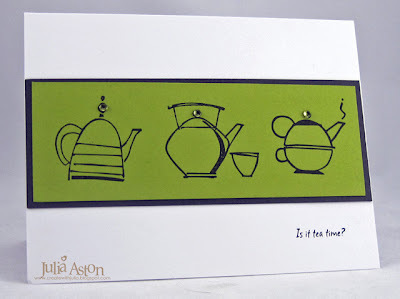 My stamps are from a fun Rubbernecker set called Tea Time Set. 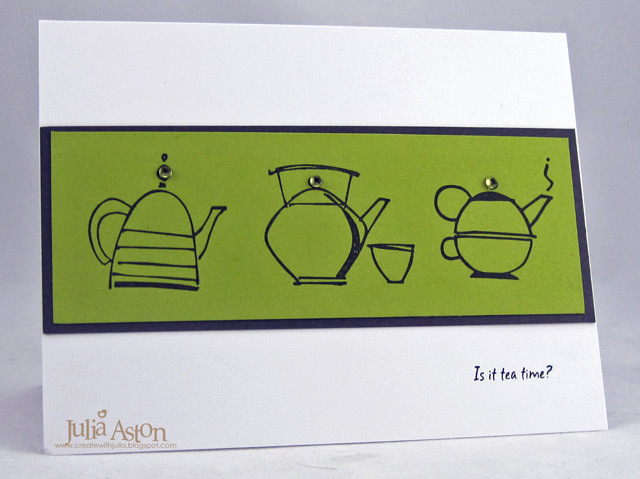 Inside I stamped "brewing up a birthday wish for you" perfect for a tea-loving friend! I added a rhinestone to the top of each of the teapots. I hope you'll stop by on Nov 1st - the Waltzingmouse Design team will be having a 4 day SoAP (Stamp of Approval Parade) using previously released WMS Christmas Stamp sets! 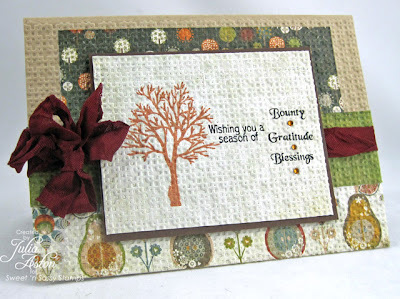 I made this card for today's CAS sketch challenge over on Split Coast as well as the Waltzingmouse October Christmas card challenge held in the WMS forum - to use food on your card!. I stamped the group of three candy canes in red on the card, than stamped the gingerbread men on Really Rust and cut them out layering them over the candy canes with foam tape. I added black sticky pearl eyes and buttons, stamped the sentiments in two colors of ink and drew the frame around the edges with a 01 Micron fine black pen. My stamps are from the newly released Waltzingmouse Set called Candy Jar Christmas Fillers. You may have noticed I've been missing in action for the last several days - we had our annual Church Fair this past Friday and Saturday and two friends and I run a table selling stamped cards and crafts - so I was madly working on last minute projects as well as organizing and pricing all the items I had managed to finish! 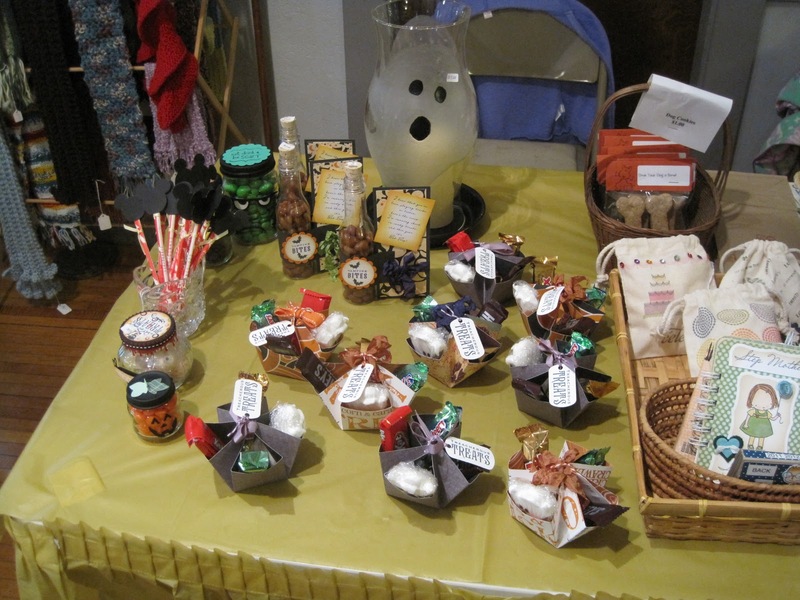 Here are a few pictures of our table. Over the two days we sold $227.00 from our table - pretty good when you consider most things were between $2.50 and $4.00! 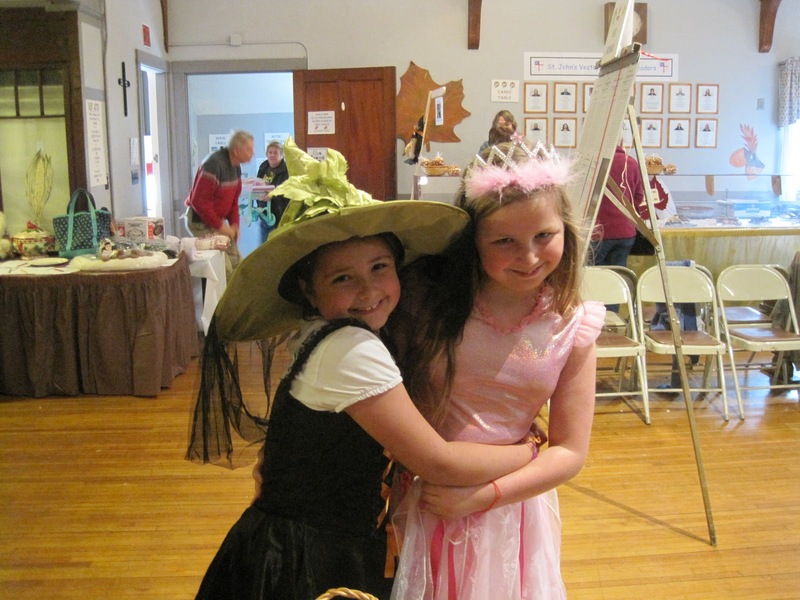 And here are Gwen and Nicole (Gwen is the daughter of Elizabeth working with me and Nicole is the granddaughter of Sandy, co-chairperson of the Fair)- the theme for the fair this year was The Wizard of Oz - so they were dressed up like the bad and good witches! They had such a good time running around and also helped us stamp "thank you" on our brown lunch bags we used for sales. 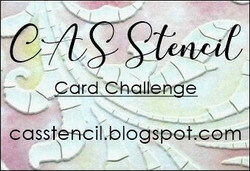 So now things will be a little less hectic for me and I will settle back into my regular stamping routine! 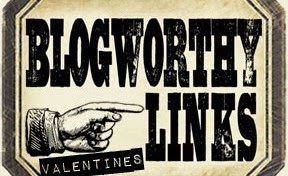 Today I'm participating in the Friends of Waltzingmouse Blog Waltz that is run out of the Playroom in the Waltzingmouse Forum. Why don't you check it out and join us each month on the 17th day!? It just takes a few minutes to sign up to be a member of the forum. 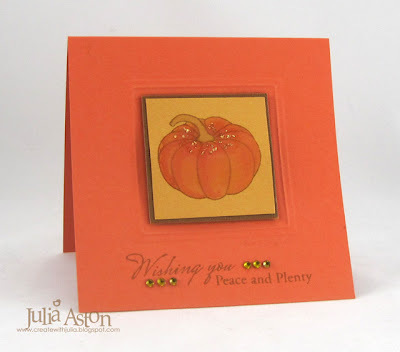 My card is a CAS one today - I stamped the pumpkin and water colored it, using a water pen brush and ink smudged onto the cover of my ink pad - I love the soft subtle color water coloring gives. I embossed a square Nestability on my card (you've probably noticed this is one of my favorite things to do on a card!) 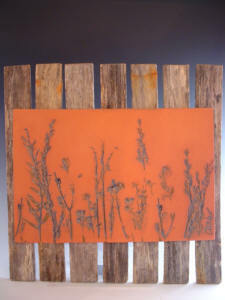 and layered the pumpkin panel inside the frame using foam tape. I added a little bit of Diamond Stickles to create 'frost on the pumpkin'! Thanks so much for coming by today! I'm off to check out all of the Thankful cards linked in the forum! 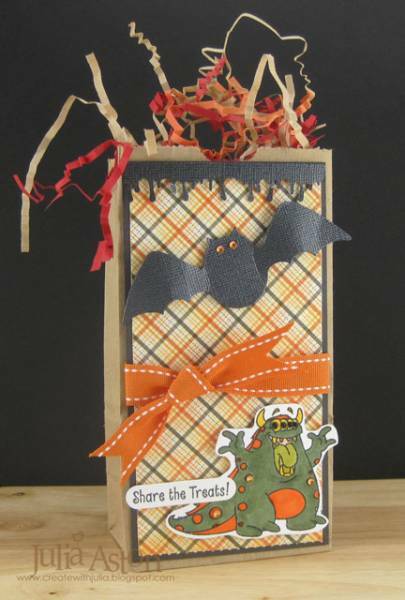 Rubbernecker Fall DT Blog Hop - Share the Treats! Hi Rubbernecker friends!! 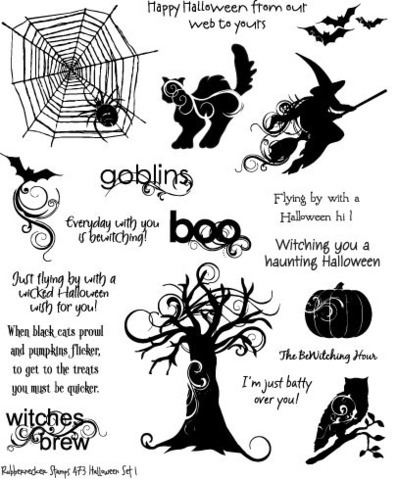 Welcome to our Fall/Halloween hop! Thanks so much for joining us! 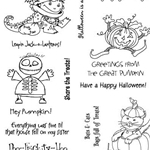 Rubbernecker Stamps has such a wide variety of images, that we thought we would share some Fall and Halloween ones with you! There is a HOP ROUTE for you to follow below! Make sure to leave some LOVE at every stop in order to be eligible for our PRIZE!! What fun would it be without a PRIZE!! ***You could WIN Your choice of one of these AWESOME stamp sets!! Cool huh? 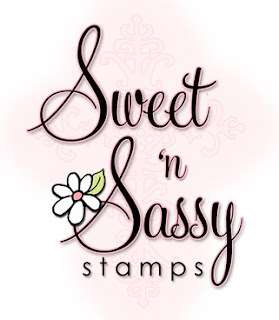 OK, the Stampin’ Sisterhood has lots of creations to share with you, so grab a cuppa, sit back, relax and get HOPPIN’!! Be on the look out for our NEXT HOP coming NEXT MONTH!! We look forward to seeing you then for MORE sharing and prizes!! Thanks again for joining us today and ENJOY!! 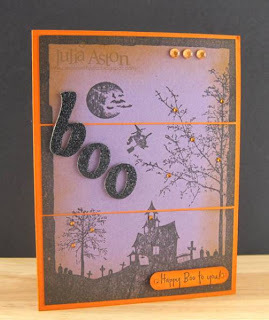 I'm sharing three Halloween creations today - made with brand new Halloween stamps from Rubbernecker! The first is a card I made using a Split Coast Sketch. I turned the sketch on it's side to fit my spooky Halloween night background stamp image. 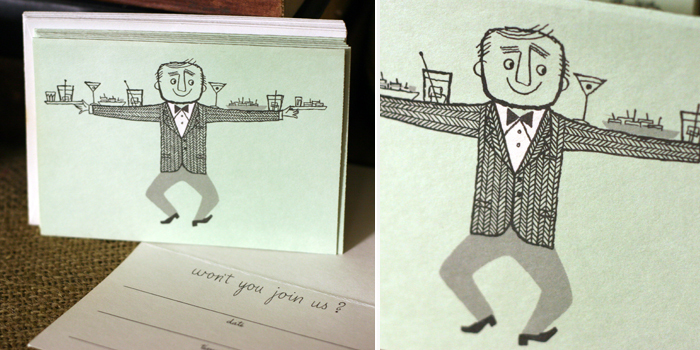 I cut the image in thirds and adhered it to the orange card base. I added some rhinestones and black glitter Thickers. I sponged all the edges with Spiced Marmalade ink. 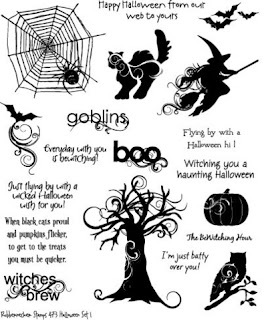 This flying witch panel stamp is a brand new image from Rubbernecker, the Happy Boo to You Sentiment is from last years Halloween Set 2 #474. The second is a Halloween Treat bag I made for the Ways To Use It Challenge over on Split Coast, to use a lunch sack. 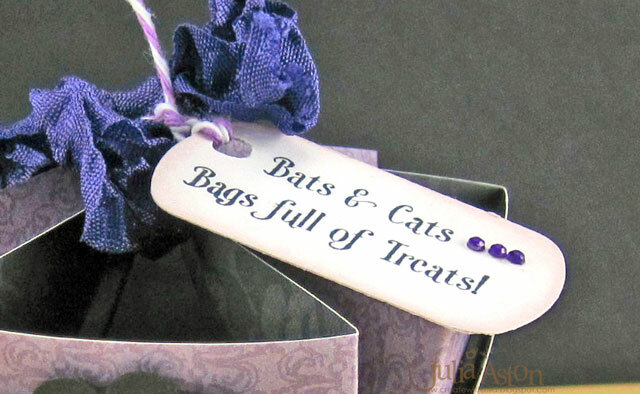 I decorated the paper bag with some patterned paper, a drippy edge punch, and a Sizzix bat. My monster named Squints is one of the new Halloween images from Rubbernecker. And Squints wants us to Share the Treats! I guess we'd better listen to this guy - he has 4 eyes so he'll certainly see if we don't!! My third project is a little candy treat bowl - made from a 6" x 6" piece of patterned paper. Sue made one on Split Coast and gave these instructions. Basically you score your 6"x6" piece of paper at 2" and 4" on both edges so it looks like a tic tac toe board - then you score diagonally on the corners so they fold in. 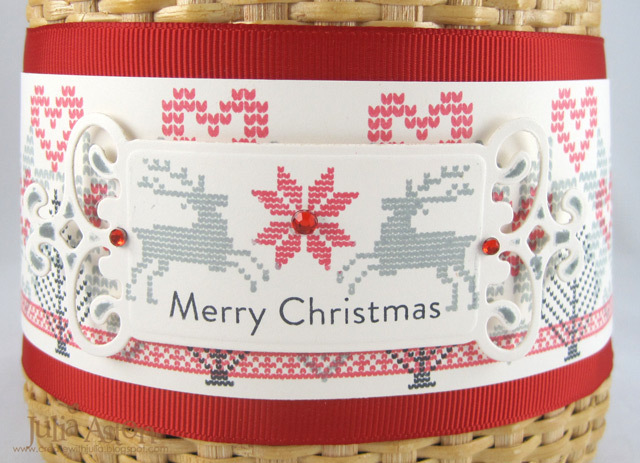 Punch holes on the inside pieces to tie your ribbon through. Sue says it's better to use a patterned paper as it's thinner than card stock and folds up more easily. 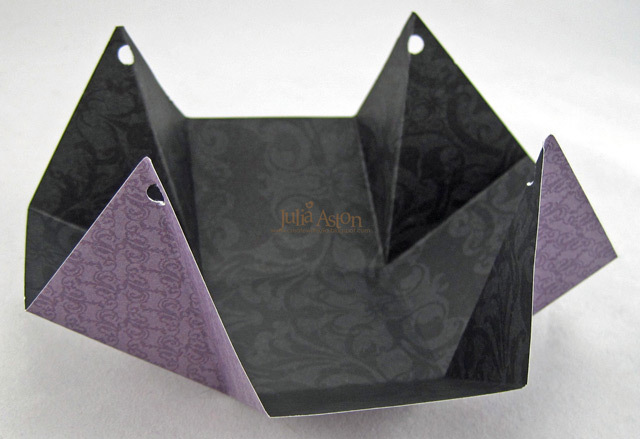 Here are a couple of pictures showing the scoring and partial folding so you get the idea! 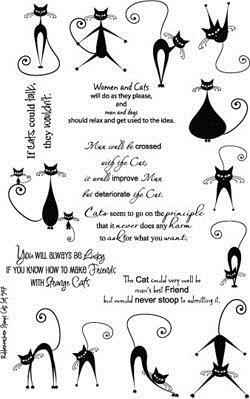 I stamped 4 different cats on white, punched them with a circle punch and layered them to a scallop circle. I sponged the edges of the circles and added purple Tiny Twinkles to the eyes for a little glitter! 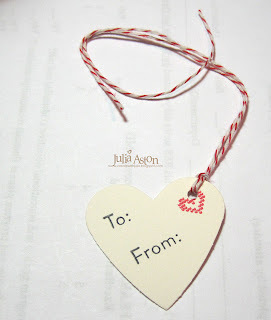 I stamped the sentiment and punched it with the SU Keytag punch and tied it to the ribbon with bakers twine. Each little section will nicely hold one or two of the miniature candy bars. 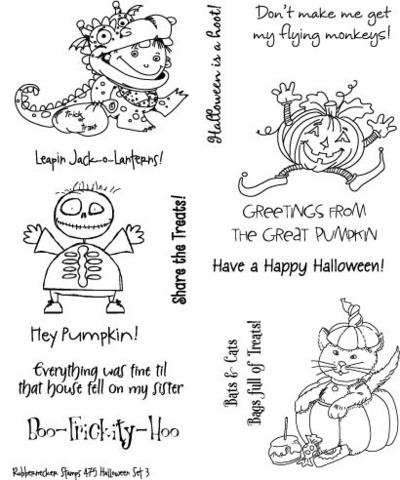 Now I hope you'll hop along to all of our DT members linked below to find more Fall/Halloween Inspiration - remember to leave comments along the way so you have a chance to win a free Rubbernecker stamp set! 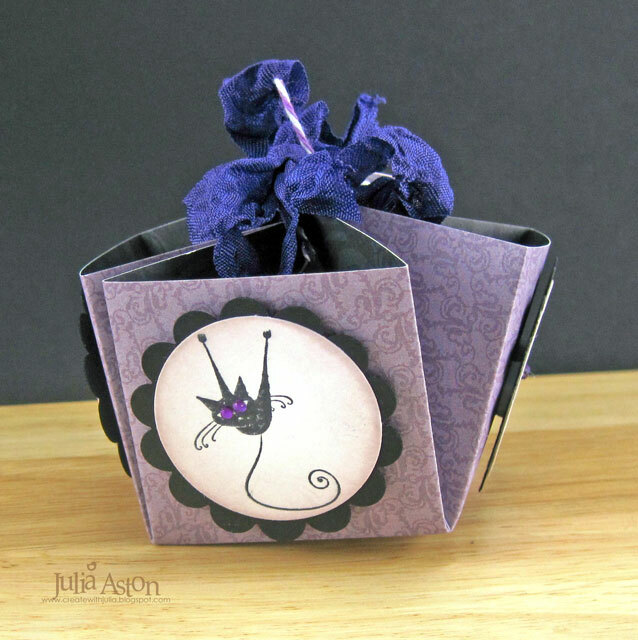 Welcome to the Waltzingmouse October Release day!! 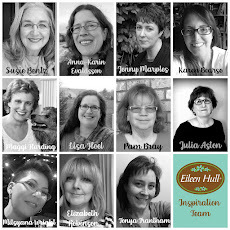 To celebrate this great occasion, the Design Team is having a Blog Waltz - and you can win a WMS stamp set just by leaving a comment on each DT's blog today! 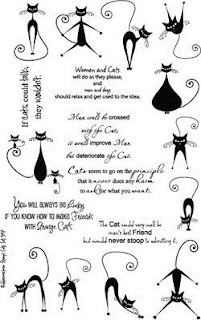 You should start the Waltz at Belinda's blog, if you came here from Sandie's blog you're in the right place! If you lose your way - you will find the complete Waltz list on Claire's Blog. 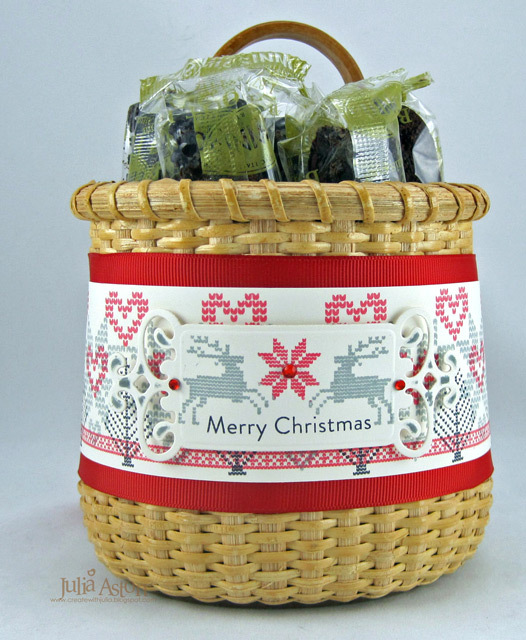 Today we are using the two last sets of the release - Candy Jar Christmas and Candy Jar Christmas Fillers - two wonderful sets for packaging those cookies and sweets we love to give during the holidays! I always bake cookies and other goodies to give friends and coworkers when just a thoughtful little gift is needed. 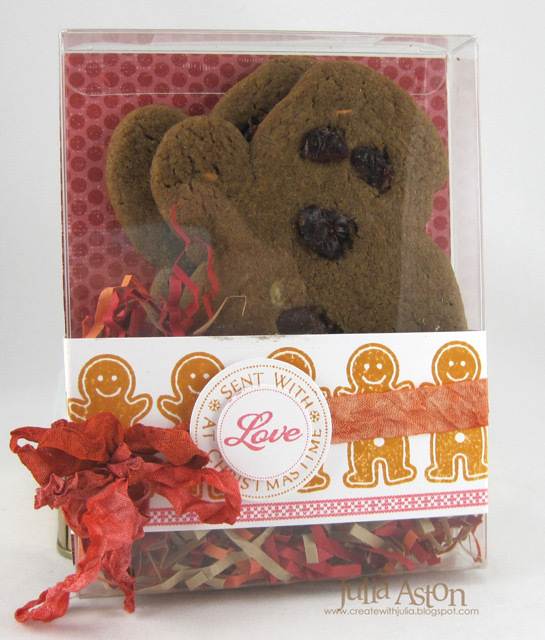 So first up is a clear box of Gingerbread Men! 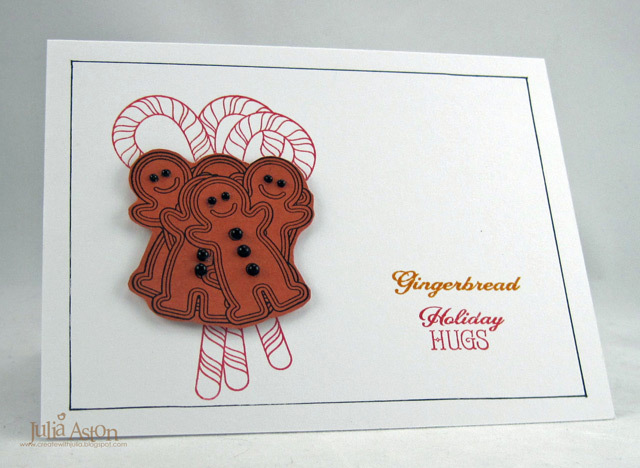 I made the front strip 2 x 6 1/2" and stamped my gingerbread men from Candy Jar Christmas in a row. 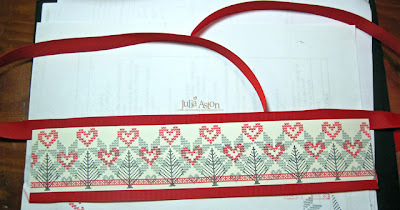 Then I stamped the slim red border from Nordic Winter along the bottom. 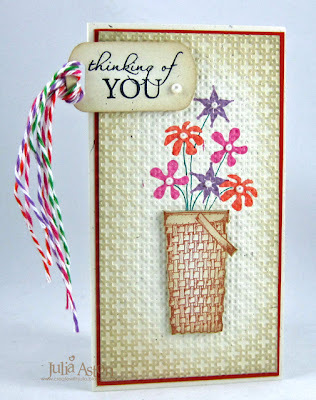 The circle sentiment is from Candy Jar Christmas Fillers. 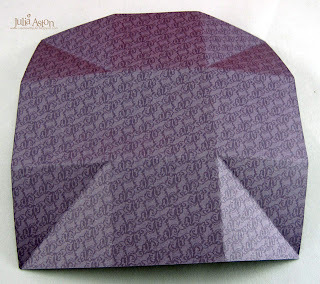 I adhered a piece of patterned paper on the outside of the back of the box with the pattern facing in so it showed behind my cookies. I used small glue dots on the corners and sides to adhere it so it didn't show too much. 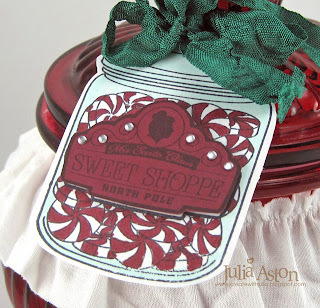 Before I adhered the patterned paper - I stamped all these sentiments on the white side, they are all from Candy Jar Christmas accept for "to help you make merry" which is from Seasonal Remedies! 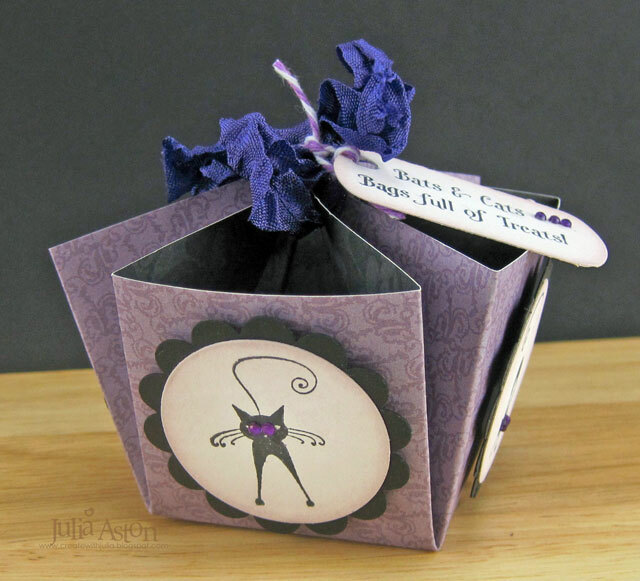 The frame is a Spellbinders Classic Frames. Then I decorated this wonderful jar (again from the Christmas Tree Shop for just $2.99!) 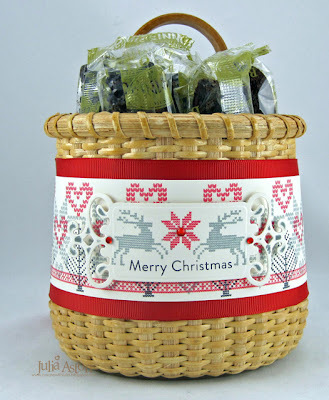 with images from Candy Jar Christmas Fillers. I love having holiday traditions - and I think getting this jar of sweets out each year would be a lovely one don't you? I didn't have enough peppermints to fill the jar so I just laid a few outside so you'd get the idea!! 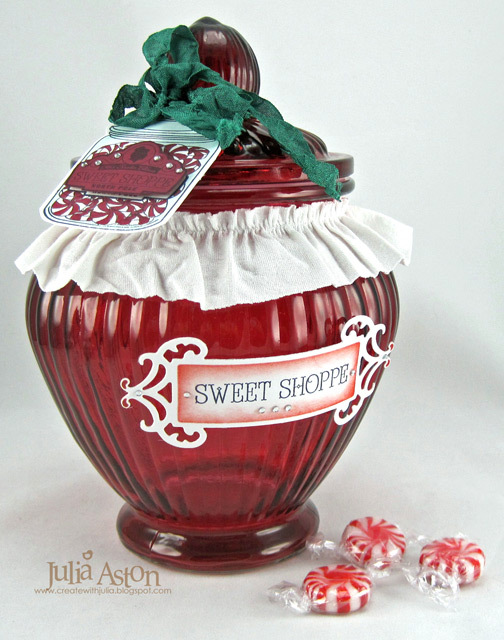 Here's a close up of the pretty peppermint jar - I layered the label over the jar and added some clear tiny twinkles. 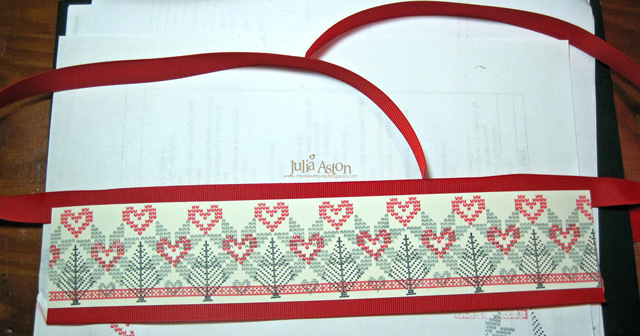 This pretty pleated ribbon strip is from Pink Paisleee. Now don't forget to leave comments all along the waltz for your chance to win a WMS stamp set! And don't forget to go shopping! Commenters have until October 17th 11:59 PM, 5:5 9AM Central, 3:59 AM Pacific and 6:59 AM Eastern. The winner will be announced on Claire’s blog October 18th. Next on the Blog Waltz list is the ever creative Kate! Waltzingmouse Oct Preview - Day 3 - Ornaments and Santa! Wow - here we are at Preview Day 3 already! 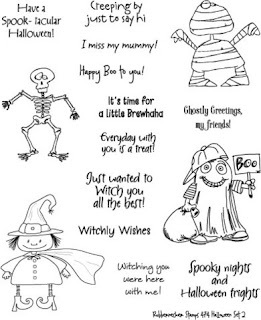 Hope you've got your 'must have' list written up and ready for tomorrow! 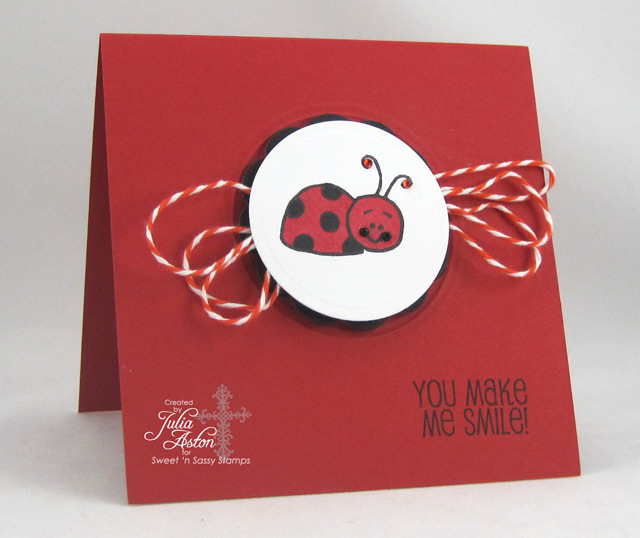 I had so much fun creating with these stamps that I made 3 cards! 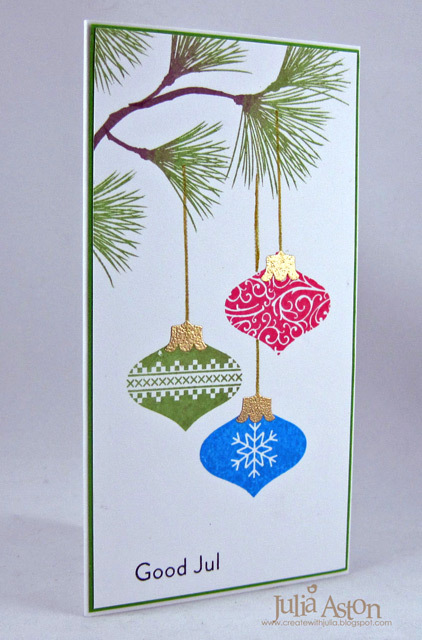 For my first card - I stamped three of the smaller ornaments as if they were hanging from this lovely pine branch - don't you love the wonderful designs on them?? I was still in the Nordic mood from yesterday (!) so I used the Good Jul sentiment from Nordic Winter. The pine boughs are from Festive Foliage. 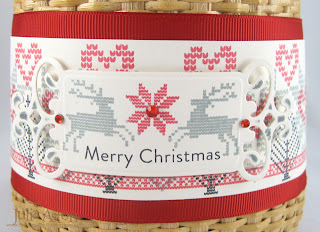 I gold embossed the tops and strings of the ornaments which are separate stamps. I masked the red ornament in order to stamp the string on the blue ornament "behind" the red one. I got a little more elegant with my 2nd card - gold embossing this lovely large ornament and cutting it with my 2011 Heirloom Ornament die (although it would also be very easy to cut this out by hand.) Then I just looped a gold cord through a hole in the top and let it drape down. I thought this paper looked like a wall in a cozy parlor! 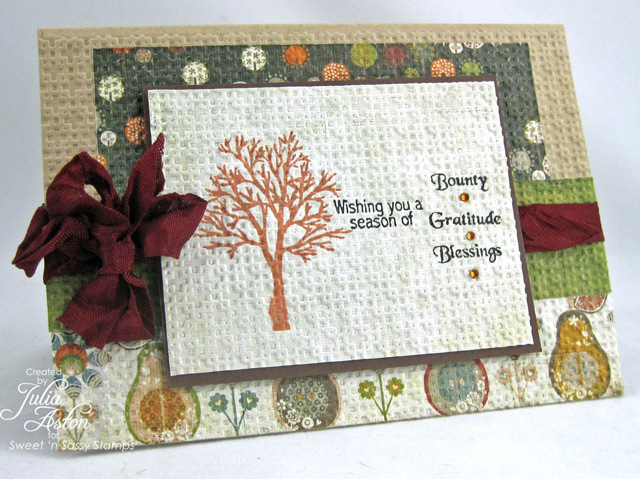 The sentiment is from a set from last month's release - A Cottage Christmas. I used stamps from Santa's Coming to Town for my last card - a little more playful and fun! 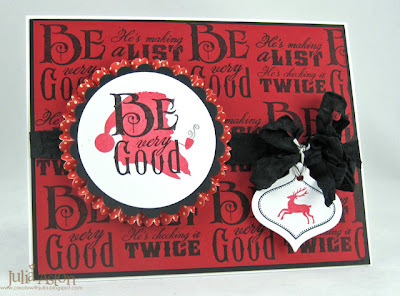 I stamped the background with two stamps from this set - using one of them again over stamping the Santa silhouette. I created his pipe smoke with a little steam stamp from Afternoon Tea! The little ornament with the deer is from 2011 Holiday Ornaments and I cut it with the smallest 2011 Heirloom Ornament Die. I made a paper rosette out of dotted red paper to layer my Santa silhouette on. So there you go! Ornaments and Santa! 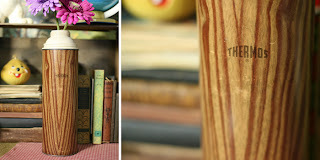 Tomorrow we'll be have a DT blog hop previewing the final two sets - and just wait until you see them!! 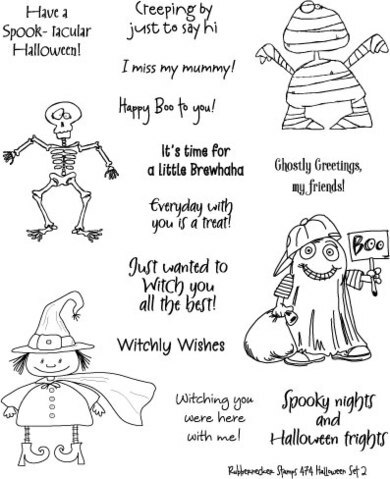 - they're all about baking and candy treats! 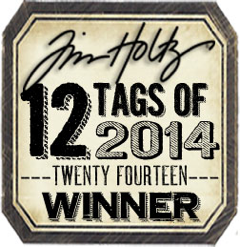 Be sure to stop by because you'll have a chance to win a Waltzingmouse Stamp set just by commenting! Tomorrow we'll be posting at 2 pm EST so Claire has a chance to set up the new sets at the shop! Stamps: Waltzingmouse - 2011 Holiday Ornaments, Good Jul from Nordic Winter (to be released 10/15), pine boughs from Festive Foliage. Stamps: Waltzingmouse - 2011 Holiday Ornaments (to be released 10/15), sentiment From Our House to Yours from A Cottage Christmas Set. Accessories: hot gun, gold embossing powder, gold cord - Prairie Bird Boutique Etsy Shop, lace - Mark's Finest Papers, ribbon - Mar Arts, cropadile, foam tape. Stamps: Waltzingmouse - Santa's Coming to Town, deer and ornament from 2011 Holiday Ornaments (to be released 10/15), steam stamp from Afternoon Tea. 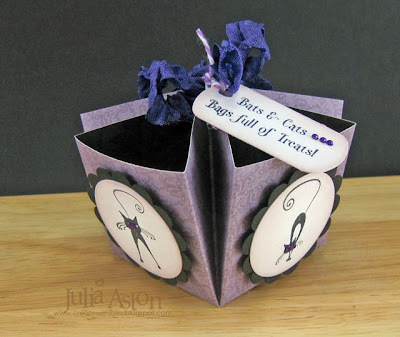 Accessories: Twine - PTI, 2011 Heirloom Ornament dies Spellbinders., wrinkled seam tape - Prairie Bird Boutique Etsy shop, glue dots, Circle & scallop Circle Nestabilities, paper rosette die - Tim Holtz Alterations. 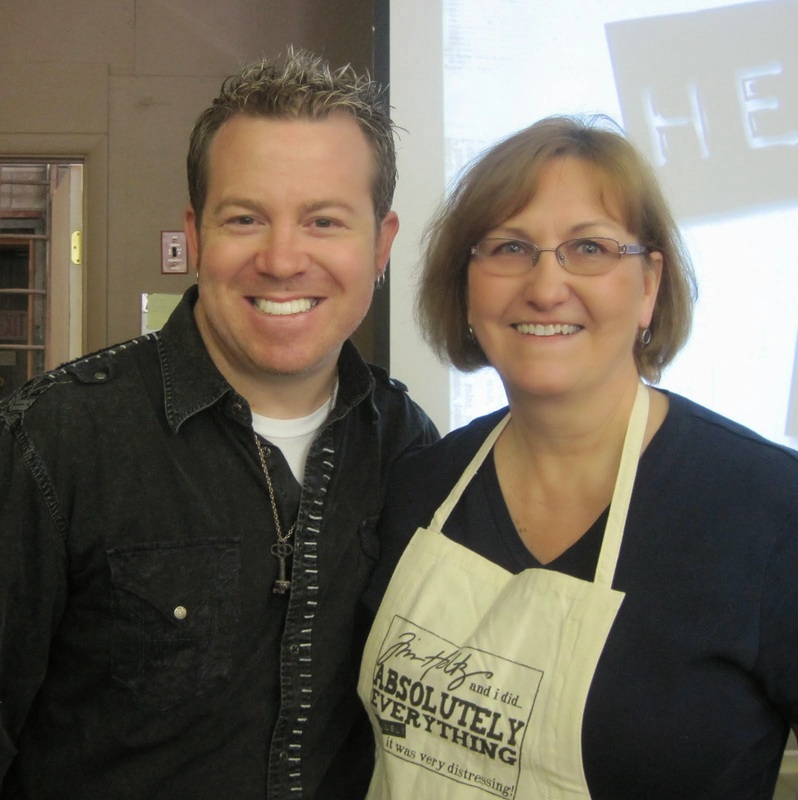 My goodness - didn't you just love all the inspiration yesterday!?!? Well - hold onto your hats (or your sweaters!) ladies - today we are previewing a set like no other - Nordic Winter! I think most of us have had a sweater in the Nordic patterns at some point in our lives. We had a world traveling Aunt Helen that brought my sister and I Nordic Sweaters when we were young - mine had red in it and Marcia's had blue and both had those lovely flower stamped pewter-like buttons! and I must say - itchy as heck as they were wool! 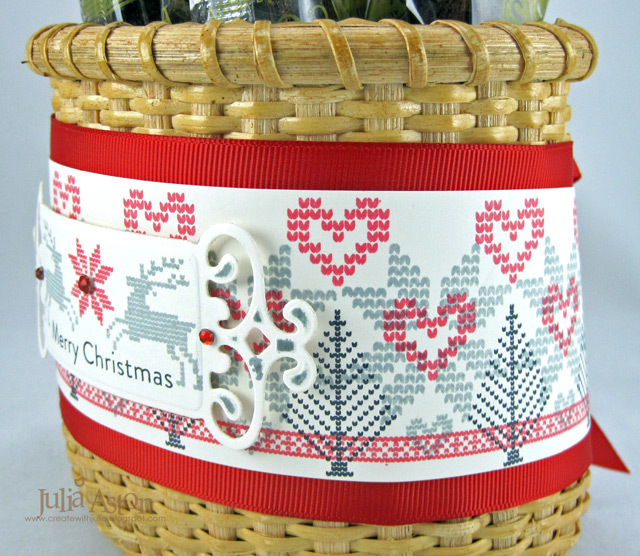 Today I decorated a lovely basket (I got at the Christmas Tree Shop for just $2.99) using several single stamps from the set to create my own Nordic pattern. See how the patterns of the stamps look like yarn stitches?! I took pictures while I was stamping my panel so you could see the individual stamps I used and how I stamped them. First I drew a line in the middle of my panel to help me stamp the first snow flake/star image straight across! And finally I stamped a narrow red strip along the bottom. I added red grosgrain ribbon to the top and bottom of the panel with ScorTape - extending the ribbon on the top past the edges of the panel so I could tie it in a bow at the back of the basket. I hate having an open unfinished space and I think this finishes it off nicely! I used both ScorTape and thick glue dots to adhere the panel to the basket as there is a shiny finish on it and Scor Tape wasn't enough alone to keep it held on. 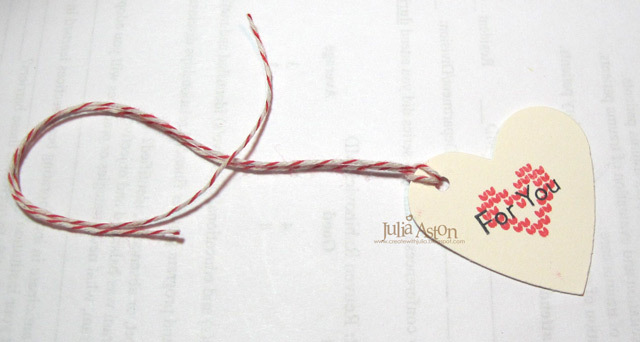 I also made a little tag using stamps from this set to tie around the ribbon with twine. 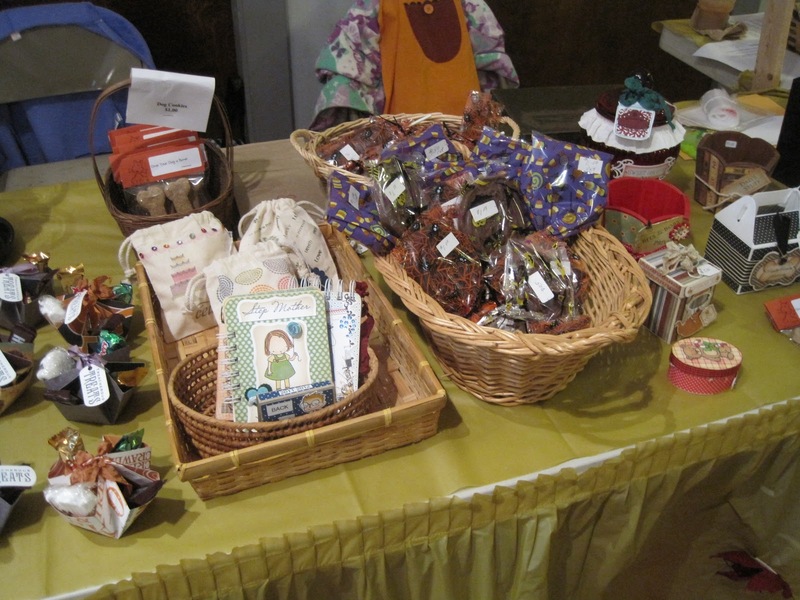 I filled my basket with yummy Nonni's Chocolate Decadence Biscotti. I may have to go back to the store to pick up a few more of these baskets - 'cause I think I'm keepin' this one!! I've got so many more ideas for using this set - I can't wait to have some more time with it! So let's go check out what the rest of the Design Team created! I can't wait to see - can you!??! 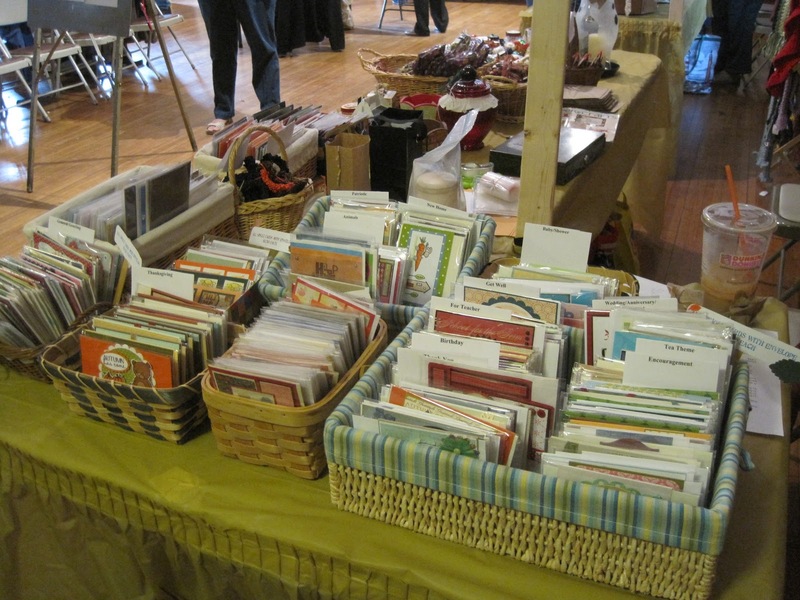 Hope you will stop by again tomorrow to see what we have for Preview Day 3! WMS Saturday Sketch Challenge - No Peeking!